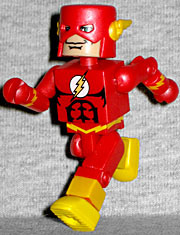 The Flash got his first Minimate in the C3 line, but that was based on his JLU appearance, while this one is based on the comics. What are the differences? Well, there are no black outlines around the lightning bolts on his wrists and waist, the logo on the chest is different, and there's more detail in the anatomy tampographed on his chest. He gets a new mask with the wingy earpieces (rather than the lightning bolts the old one had) and eyeholes to allow him to see out. That one's a bit of a mistake, since this is the Wally West Flash and his mask actually did have white eyes in it. Barry even commented on the change when he saw it. His boots have a ridged texture on the soles, which is another feature taken straight from the comics. You can remove the mask, and so that Wally's not running around bald all day, he has a new piece of hair. It's quite nicely detailed, much more intricate than you might expect. It's parted on the left and short spikes of hair jut out randomly, so it actually looks like hair would. He's got a smug smile on his face - this is a guy who loves his powers and the life of a hero! Flash's foe in this set is Gorilla Grodd, the psychic monkey. We considered just putting "this is a Minimate gorilla" over and over, because what else could you possibly need to know? 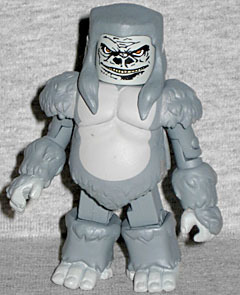 This is a Minimate gorilla - of course you're going to want him! But let's pretend for a moment that the words "Minimate" and "gorilla" aren't enough to make you track this set down, and instead extoll his virtues. For one thing, he's built on the 2½" Minimate body, so he towers over the heroes. Like Clayface, he has a lot of extra pieces to complete his look: new feet (with thumbs!) new furry arms, a big, detailed chest cap to give him a pot belly and furry shoulders, and a hair piece complete with his silly sideburns. The face is far more detailed than any other Minimate, to make sure we know he's an ape, rather than a human. Grodd gets an accessory, and it's a rather odd one: he gets a skull. What? Why? 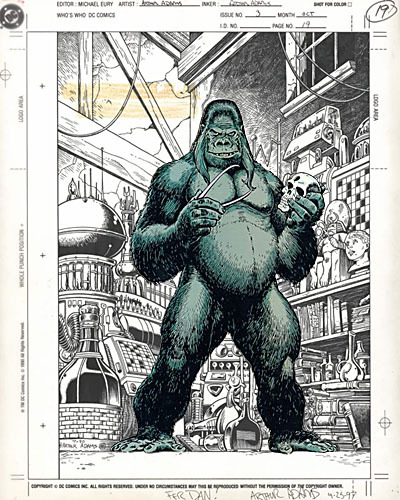 Well, probably for the same reason the first DC Direct Grodd came with a skull (and calipers) - because it's based on a specific piece of art by superstar Art Adams. But still, why? It's not like he traipses around with a skull in the comics. And why did they print it on a translucent Minimate head? A 2½" Minimate head, too: so it's too big to be a human skull. And hy is it so bloody ugly? Bad choices, all around. Flash is a good figure, which is a reflief: after all, Grodd is a Minimate gorilla, so you'd be getting the set no matter what. At least you're not stuck with a dud. This entry was posted in Art Asylum, DC, MMMR and tagged Flash. Bookmark the permalink. Let's save time with the next minimate review. Here's how you do it: This new minimate set is exactly like every other minimate set. The figures have different paint and parts to make them different characters. Exciting! The end. You sure you're not thinking of DCU Classics? ...or Halo or NECA or JLU or SportsPicks or Iron Man or any of a dozen other toylines?